Spider-Man will launch his third movie series in 15 years with Spider-Man: Homecoming later this year. As well as the live-action series from Sony and Marvel Studios, an animated movie is also in the works. The animated Spidey is being written by The Lego Movie's Phil Lord and Chris Miller and will be directed by The Rise Of The Guardians' Peter Ramsey and Bob Perischetti (co-writer of The Little Prince). A recent Sony Pictures Animation event confirmed a key detail of the film that had been rumoured for a while. Which is is the fact that this particular Spider-Man will not be Peter Parker, but instead will be the big-screen bow for Miles Morales. Miles Morales took over the role of Spider-Man in the comics in 2011 (in the Ultimate Universe continuity) following the death of Peter Parker. 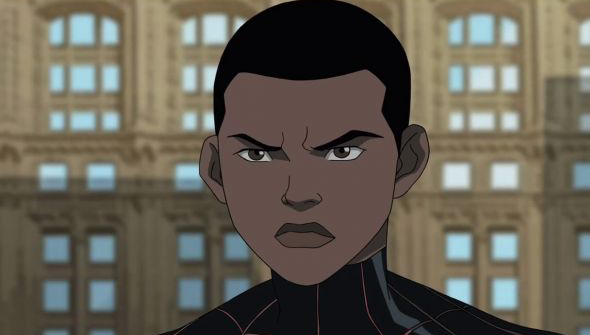 This is a shrewd move on Sony's part, because not only does it distinguish it from the main live-action Spider-Man films, but in a time when audiences are crying out for more diverse characters, it will be good to see Miles take the lead. Morales has appeared in animation before, as a regular of the Disney XD Ultimate Spider-Man series. There he was voiced by Donald Glover, which was a nice nod to the fact that the actor was cited as one of the inspirations for the character. The actor will also be appearing in Spider-Man Homecoming, but will this be his only big-screen connection with the webslinger? We'll have to wait and see. The currently untitled animated Spider-Man movie is due to be released in December 2018.